We offer many types of pillow stuffing for projects such as pillows, teddy bears, and more. These do-it-yourself hard to find components will help you create the perfect product. Be sure to visit our lining fabric page for proper fabrics to use with each pillow stuffing. 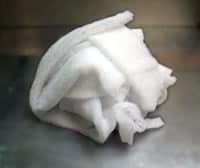 Pillow stuffing made from small curled polyester fiber is sometimes referred to as a "down alternative." These tight little balls of polyester fiber make excellent pillow stuffing. 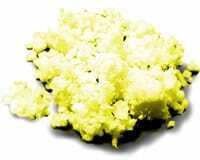 This is a loose fiber great for making pillows, "fake snow", and is fine for use inside or outside. 1 pound fills 1 cubic foot. Cushion stuffing is done by adding cluster fiber to your existing back cushions. Use this cushion stuffing to fill flattened back couch cushions. Simply unzip the case and then slit a small hole in the worn out back cushion channels and then use this cushion stuffing fiber to refill each channel. We offer this service. You may simply bring them in and we charge a flat labor of $20 plus however many pounds of stuffing are required. Please allow a few hours for us to do this. 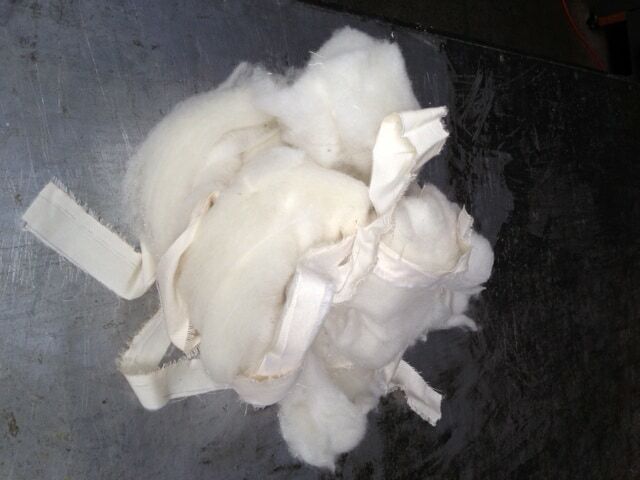 Scraps of polyester batting that can be used to fill any large sacks or products. It's the least expensive pillow stuffing you can buy. Shipping charges can be more than the product costs. 1 pound fills 1 cubic foot. This pillow stuffing is light weight. A few pounds goes a long way. Made from new scraps of polyurethane foam. Perfect for restuffing a bean bag chair. 1.5 pounds fill 1 cubic foot. Please note: The 25-pound bag of shredded foam includes shredded foam skins/crusts. This pillow stuffing is much heavier than shredded foam. Its conforming quality makes it unique for teddy bears. 4 pounds fill 1 cubic foot. 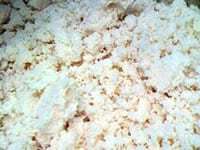 This pillow stuffing is made by shredding 100% natural latex foam. 4 pounds fill 1 cubic foot. 100% cotton batting makes great pillow stuffing. It's a heavy weight material; think cotton futon. Batting is approximately 3/4" thick and 27" wide. Just cut with scissors or rip with your hands and fold square to get your ideal thickness and firmness, then you're ready to stuff it into its case. Not for use outside. Kapok is a 100% natural and organic pillow stuffing. This natural fiber is found inside the seeds of the kapok tree. It is super soft and silky. It's a hollow fiber and was once used as the pillow stuffing inside old school orange life saver vests. 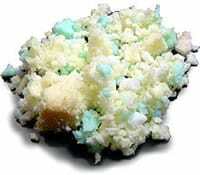 This is an ideal pillow stuffing for making outdoor cushions and pillows. For outdoor applications, use our non-woven lining or 100% polyester material. Cotton blends will mold outdoors. 2 pounds fill one cubic foot. Easily make wool pillows such as our wool bed pillows by folding organic wool batting and stuffing the case with the folded batting. This is wonderful certified organic pillow stuffing. It is 88" wide and approximately 2" thick. It will easily compress to 1/2" with pressure. It weighs approximately 2.54 lbs/yd or 1.85 oz/sqft. 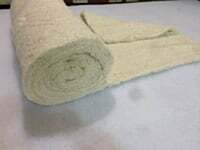 This is organic wool batting with organic cotton muslin attached to one side. Organic cotton/muslin wool pillow stuffing scraps with organic cotton fabric still stitched to the wool. These scraps come from the organic mattresses that we make. You can cut the fabric off yourself and save money on this high-quality organic wool material. Build your own down pillows and cushions. Buy grey duck or white goose down feathers by the pound (1 lb = 0.45 kg), or save even more by buying a full bag of down (18 lbs = 8.2 kg, 20 lbs = 9.1 kg). Pillow stuffing with down and feathers is soft and wonderful. Since geese and ducks are mostly covered in feathers, the higher the down percentage the greater the pillow stuffing cost. The greater the down percentage the less likely feathers will be able to leak and poke through. You can always expect some leakage with down and feather blends. You just get less leakage with higher down percent. We recommend at least 25/75 gray duck or better. If you prefer white goose, we recommend the blend 50/50. The first number represents the percentage of down in the mix and the second number represents the percentage of feathers. 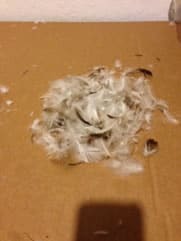 The goose feathers are slightly larger than the gray duck feathers and provide a more resilient or springy pillow stuffing mix than duck blends.